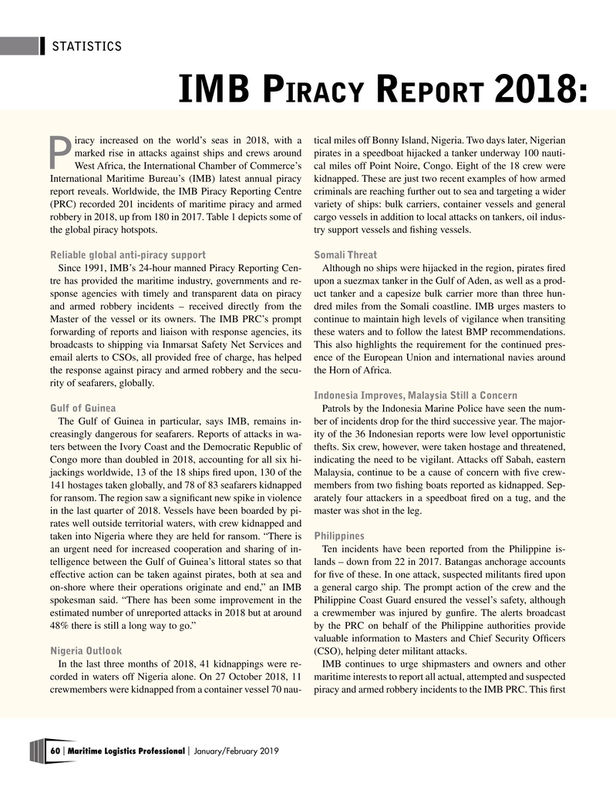 International Maritime Bureau’s (IMB) latest annual piracy kidnapped. These are just two recent examples of how armed report reveals. Worldwide, the IMB Piracy Reporting Centre criminals are reaching further out to sea and targeting a wider (PRC) recorded 201 incidents of maritime piracy and armed variety of ships: bulk carriers, container vessels and general robbery in 2018, up from 180 in 2017. Table 1 depicts some of cargo vessels in addition to local attacks on tankers, oil indus- the global piracy hotspots. try support vessels and fshing vessels. Master of the vessel or its owners. The IMB PRC’s prompt continue to maintain high levels of vigilance when transiting forwarding of reports and liaison with response agencies, its these waters and to follow the latest BMP recommendations. broadcasts to shipping via Inmarsat Safety Net Services and This also highlights the requirement for the continued pres- email alerts to CSOs, all provided free of charge, has helped ence of the European Union and international navies around the response against piracy and armed robbery and the secu- the Horn of Africa. Congo more than doubled in 2018, accounting for all six hi- indicating the need to be vigilant. Attacks off Sabah, eastern jackings worldwide, 13 of the 18 ships fred upon, 130 of the Malaysia, continue to be a cause of concern with fve crew- 141 hostages taken globally, and 78 of 83 seafarers kidnapped members from two fshing boats reported as kidnapped. Sep- for ransom. The region saw a signifcant new spike in violence arately four attackers in a speedboat fred on a tug, and the in the last quarter of 2018. Vessels have been boarded by pi- master was shot in the leg. Nigeria Outlook (CSO), helping deter militant attacks.